Tamara Carrera, left, CEO of the Community Assistance Center and Bruce Humphries, Publix District Manager for the Atlanta Central West Region. CAC is pleased to be awarded a $12,000 grant from Publix Super Markets! The grant is made possible by Publix’s annual holiday fundraiser, Food For All®, which supports programs designed to fight hunger and promote self-sufficiency in our communities. Customers and associates contribute by purchasing contribution cards in $1, $3, or $5 amounts. Grants are awarded to non-profit organizations who demonstrate progress toward mitigating food insecurity while promoting economic well-being. In 2018 Publix collected more than $4.4 million that was distributed to more than 185 charities located across the southeastern United States. This is the second year that Publix has awarded a Food For All grant to CAC. 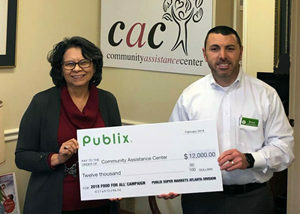 In 2018 Publix awarded CAC a $15,000 grant.